We may never know for sure, how many gay men end up marrying women and having children with them – nor all the reasons that compelled them to do so – but the book 'Gay Dad: Ten True Stories ..' gives us unique insights into the lives of some of these men and their families. Now, ten gay men from different walks of life explain, in their own words, how and why they ended up married, how they felt about their wives, what happened when they had children – and how they eventually separated from their wives and found new lives as 'gay dads'. This important book also includes meticulously researched information on many aspects of gay-life and LGBT culture as well as examining the teachings of the major world religions on homosexuality and the plight of gay people living in those countries where homosexuality is still illegal and severely punished. Charlie lives with his Canadian husband, Cameron Laux, and his daughter and son. The children divide their time between Charlie and their mother, the actress Catherine Kanter. 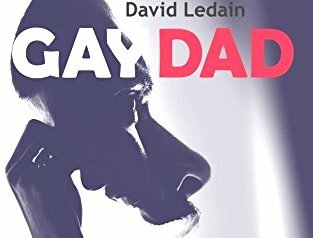 Author, David Ledain (a pen-name) is a gay man who married a woman and went on to have children with her. He and his wife are now separated but continue to share the care of their children. David hopes that the true-life accounts of the gay dads featured in this book will be of help to other gay men who married women – and to their wives and children. Gay Dad:Ten True Stories Of Divorced Gay Men With Kids Living In The UK Today is out now. CLICK HERE for more info.